After the continuous medical treatment started in September, Chief Minister Of Tamil Nadu, Jayalalitha took her last breathe on December 5th. The hospital premises were frozen in the prominent leader’s demise. 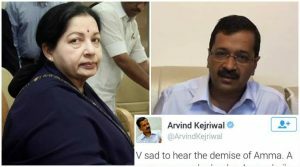 Celebrities and politicians took over to their twitter handles and paid condolences to Jayalalithaa. Despite the condolences from various people, Delhi’s Chief Minister, Arvind Kejriwal’s tweet went wrong for its twisty meaning. V sad to hear the demise of Amma. A very very popular leader. Aam admi’s leader. May her soul rest in peace. Netizens criticized Kejriwal’s tweet as a cheap feat to promote his party. Earlier, Kejriwal was slammed for his contradictory tweets and opinions on other political leaders, however, most of the time he does that on Prime Minister, Narendra Modi. This biased tweet faced a quick blow from every part of the country. Ace Indian cricketer, Jadeja took on to his twitter and criticized Kejriwal for the misframed tweet.
.@ArvindKejriwal It’s a sensitive situation, I should keep politics out of it. Sir aur kitna giroge aap? Dharti me ched ho jayega girna band kro.. kisi ki maut pe to promotion mt kro apni party ka.
.@ArvindKejriwal Sir Aam Admi ke baad party bhi laga dete. Kejriwal paid his condolences in his tweet, but the latter part mentioning “Aam Admi” is quite insensitive, because the whole tweet is framed in English except that word.